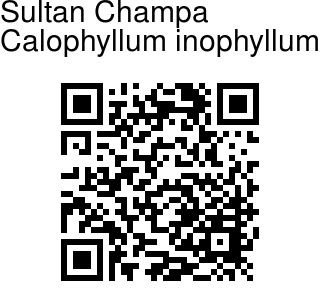 Sultan Champa is a beautiful large evergreen tree native to southern coastal India, East Africa, Malaysia and Australia. It is a low-branching and slow-growing tree with a broad and irregular crown. It usually reaches 8 to 20 m in height. The tree supports a dense canopy of glossy, elliptical leaves. The very fragrant white flowers are 25 mm across and occur in racemose or paniculate inflorescences consisting of 4 to 15 flowers. The flowers have snow-white petals with a thick center of yellow stamens. 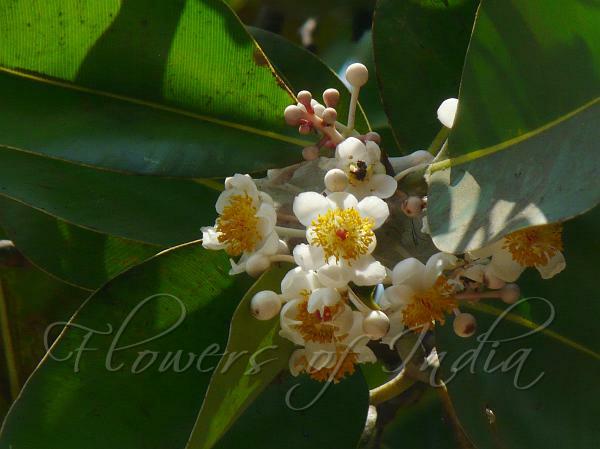 The fragrant flowers have been prized as an adornment and as a perfume. The fruit (the ballnut) is a round, green drupe reaching 2 to 4 cm in diameter and having a single large seed. When ripe, the fruit is wrinkled and its color varies from yellow to brownish-red. This tree often grows in coastal regions as well as nearby lowland forests. However it has also been cultivated successfully in inland areas at moderate altitudes. Photographed at Burondi & Malgund, Maharashtra.